Cornering the Congress for its Hindu terrorism theory, Prime Minister Narendra Modi on Monday said that the party has been forced to run away from a majority seat to a minority constituency, in a veiled reference to Rahul Gandhi contesting from Kerala's Wayanad constituency in addition to UP's Amethi seat. 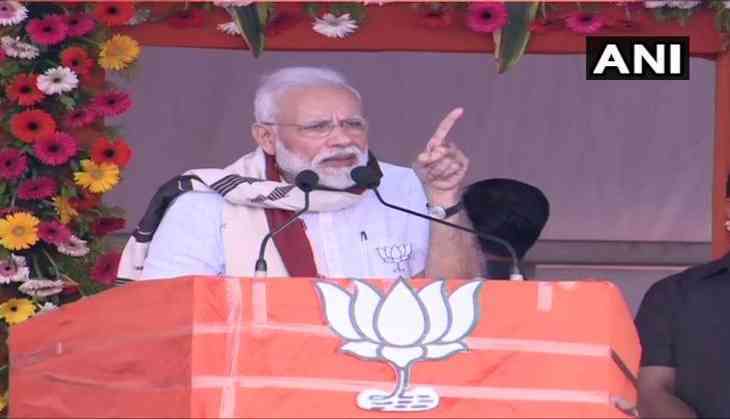 Accusing that it was Congress which attempted to put the blame of Hindu terrorism on the people of the country, Modi said: "When Sushil Kumar Shinde was a minister, he had spoken about Hindu terrorism from this land of Maharashtra. However, a few days ago the court's decision came which exposed the Congress conspiracy in front of the country. Congress has insulted Hindus." He added, "Congress has done the sin of defaming our more than 5000 years old culture. The peaceful Hindu society which considers the whole world as its family was called a terrorist. That is why they have been forced to run away from a majority seat and go to a minority seat", he added. Further attacking the Congress, the Prime Minister said that the Opposition's insults are like a jewel to him. "One of the senior Congress leaders said that Modi has only guarded toilets. Isn't it an insult for those who have been guards of cleanliness for years? I also want to tell Congress that they might have tried to insult me but I am accepting it with pride. Your abuses are like jewels for me because when I guard the toilets, I also guard the honour of crores of women of India," he said. Taking a jibe on NCP leader Sharad Pawar for not contesting the elections, he said: "There was a time when Sharad Pawar thought that he too could become the Prime Minister. He first announced that he would contest the election but suddenly stated that he is happy in the Rajya Sabha. This is because they also know which side the wind is blowing. Also, a family war is going on in the NCP. The party was founded by Sharad Pawar. However, his nephew is slowly capturing the party. For this reason, the NCP is also facing trouble in ticket sharing." Prime Minister Modi also alleged that the Congress and NCP alliance in Maharashtra is like Kumbhakaran (a mythological character known for sleeping for six months in continuation) who "sleep and loot money from public alternatively in every six months". "This is the same Congress-NCP alliance which allowed the mob to destroy the Azad Maidan memorial of martyrs," he added. He also congratulated the nation on the launch of ISRO's PSLVC45 and announced an initiative that the government has begun with this launch. "I would like to congratulate our space scientists and ISRO for their achievement. Previously when there were such launches only a few selected people were allowed to witness it. But to increase interest in science and respect towards scientists, we had taken decisions that during such satellite launches, common men will be provided facility to witness the great achievement of India. This initiative started today and today's launch was witnessed by hundreds of people present at the launch location,' he said. The seven-phase Lok Sabha elections are scheduled to be held from April 11 and will go on till May 19. Maharashtra will go to polls in the first four phases. Results of the polls will be declared on May 23. #AllPartyMeet: Is Modi really trying to save the #BudgetSession?